Are the climate changes we perceive today just part of the Earth system’s natural variability, or are they new phenomena brought about by human activities? One way to find out is to look back at the past to get a long-term picture of how Earth’s climate has fluctuated. But it is a major challenge to find records of past climate with sufficiently high resolution to capture evidence of abrupt and brief climate shifts. Scientists have used tree rings, whose width can reflect climate conditions experienced during each growing season, and they have used glaciers, which accumulate a new layer of ice with each year’s snowfall. High-resolution ice cores from Greenland have shown multiple events during the past 100,000 years in which air temperatures abruptly rose and fell by as much as 10°C (18°F) within a decade. We do not fully understand why these abrupt climate shifts happened, but we do know that the ocean plays an integral role in the Earth’s climate system. 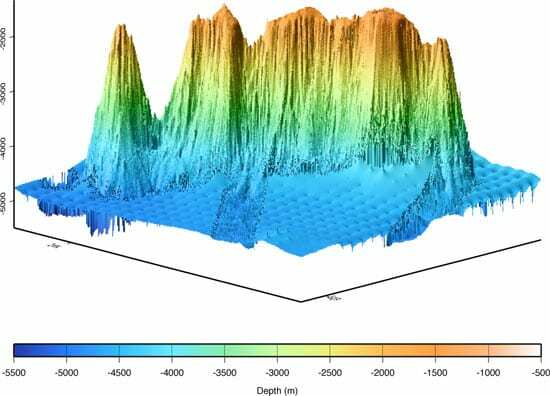 So another challenge is getting high-resolution records of how conditions and circulation have changed over time in the shallow and deep oceans. Scientists have found clues to past oceanic conditions preserved in sediment cores that accumulate in sequential layers on the seafloor. Unfortunately, burrowing organisms can mix the sedimentary layers, disrupting the chronology and obliterating traces of rapid climate change. One way to circumvent this problem is to use the carbonate skeletons of corals. They can live for hundreds of years, accreting growth layers that are not affected by mixing, and offer remarkable archives of past climate. Much like tree rings or ice cores, many species of corals have growth bands that we can count to make a timescale. The features of the bands themselves may reflect the condition of the ocean at the time the coral was alive and creating its skeleton. We can look at the thickness of each band to gauge the corals’ growth rate during a given year, giving us a general sense of ocean conditions. Or we can conduct complex geochemical analyses to extract more precise information about the ocean, such as temperature or nutrient levels, at the times when the coral bands formed. Tropical coral reef structures have helped us reconstruct important climate parameters such as the history of sea level change, sea surface temperature, and even storm events. The corals used in these studies are the ones people are most familiar with: corals that have symbiotic relationships with photosynthetic algae, which provide food in exchange for shelter, and therefore grow in shallow, sunlit, tropical waters. As a result, we cannot use them to look for changes in cold, dark places—at high latitudes, for example, or in the deep ocean. But some corals do not use algal symbionts and are able to live in cold or dark waters. They filter-feed on plankton and organic particles that fall from the surface waters to the corals living at depths as great as 5,000 meters (3 miles). Because of these organisms’ relative inaccessibility, we know a lot less about their biology and ecology. But they appear to live in all ocean basins and can live for hundreds of years. Like their shallow-water cousins, cold-water corals build carbonate skeletons containing geochemical traces that reflect the chemical and physical properties of the waters in which they grew. These corals do not always accrete annual growth bands, but we know the direction in which they grow, so we can use them to create records of the deep ocean. Cold-water corals therefore offer great potential to reveal how and when the deep oceans changed, at a level of detail that matches what ice cores tell us about climate changes on land. Jess Adkins, now an associate professor at the California Institute of Technology, began this work as an MIT/WHOI Joint Program student using samples that he picked out of the WHOI collection of materials dredged from the seafloor. 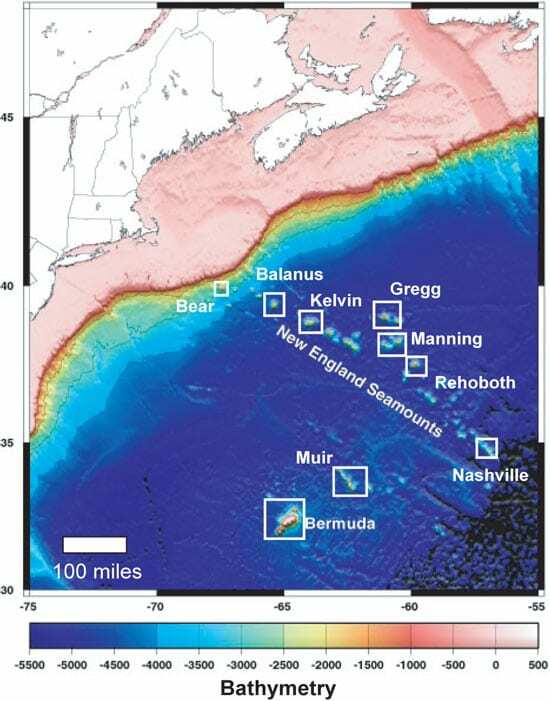 Over the past few years, I have been involved in a research program with Adkins to find and collect live and fossil cold-water corals from the New England Seamounts, a chain of extinct underwater volcanoes in the North Atlantic. We have made detailed photographic images of the seafloor to look for coral community locations and then used submarines such as Alvin to collect many thousands of fossil corals for climate reconstructions. We use careful procedures to precisely date the corals using radiometric techniques. Seawater contains naturally occurring radioactive uranium that is incorporated into the coral skeletons; it decays into thorium at a known rate so by measuring both uranium and thorium, we can accurately determine the corals’ ages. 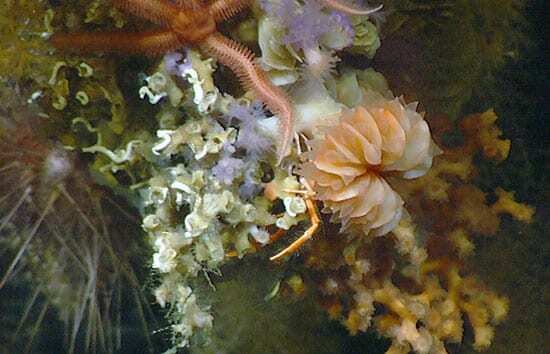 We have found that corals have been living on these seamounts for about a quarter of a million years. 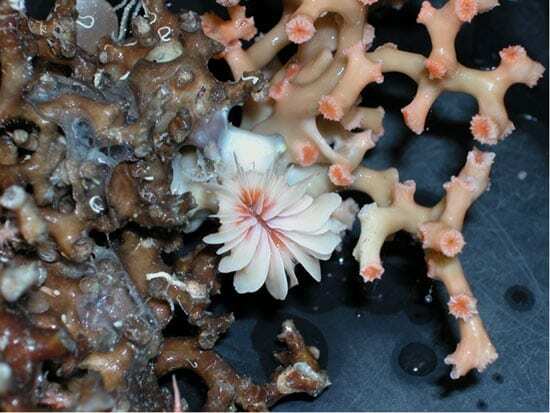 By dating many of the corals collected from the New England Seamounts, we have found a surprising temporal relationship between the abundance of corals and changes in the circulation of the deep sea. 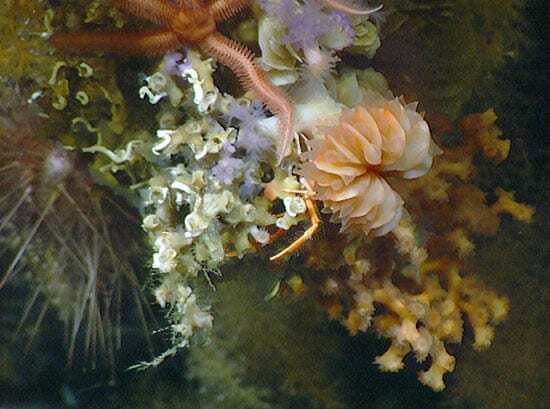 Deep-sea coral populations on the New England Seamounts were abundant near the times at which we know there were major reorganizations in the climate and circulation of the North Atlantic. We do not know whether changes in the sea surface environment increased the production of marine life, leading to more food for corals, or whether ocean circulation changes enhanced the dispersal of coral larvae. To investigate changes in deep-ocean circulation, we also analyzed the corals for carbon-14, a naturally occurring radioactive isotope of carbon that forms in the atmosphere and dissolves into ocean surface waters. Coral skeletal bands with high amounts of carbon-14 reflect times when surface waters in the North Atlantic were sinking to the depths of the ocean and flowing southward; bands with less carbon-14 reflect times when the deep-ocean circulation had shifted, and the corals were bathed in waters that had probably flowed northward from the Southern Ocean. Because carbon-14 is nearly fully decayed after 45,000 years, we are developing (with funding from the WHOI Ocean and Climate Change Institute) new chemical techniques using other naturally occurring radioisotopes that have longer half-lives. Our goal is to create a well-dated, high-resolution record of North Atlantic deep-ocean circulation changes over the past 80,000 years that can be compared to ice-core records of climate. As we discover cold-water corals over more and more parts of the seafloor, we can realize their potential to provide unique records of how the deep oceans and climate interact and to help us understand the ocean’s role in climate change, past and future. 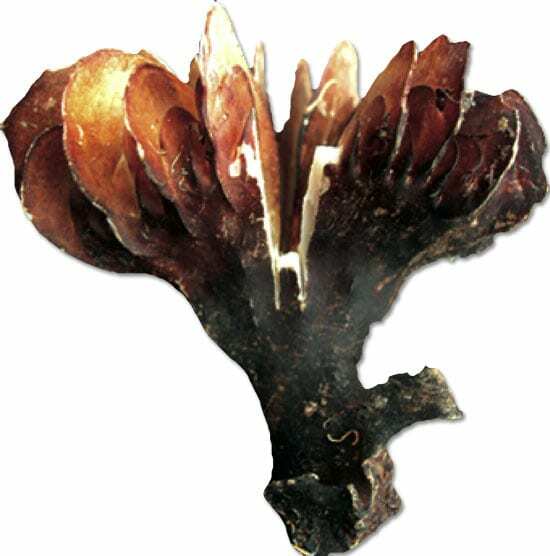 Individual specimens of the coral Desmophyllum dianthus live for decades to hundreds of years and have visible banding patterns. The vertical growth axis of the coral runs from bottom (oldest) to the top (youngest) in this section cut through a coral specimen, and you can clearly see this banding.